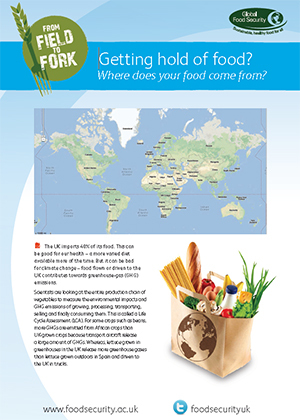 This educational resource outlines food security activities for use in schools. 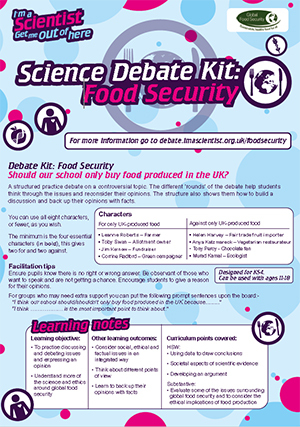 This debate kit encourages students to evaluate some of the issues surrounding global food security and consider the ethical implications of food production. 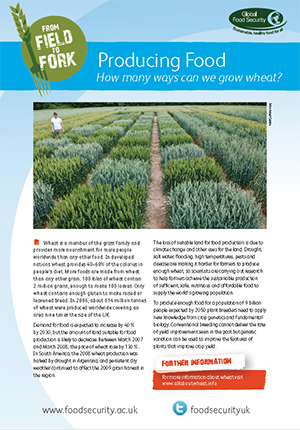 This educational resource was originally produced as part of a public exhibition, providing an overview of the food security challenge and how scientific research is being used to help address the issues. This educational resource outlines food security activities you can try out at home. 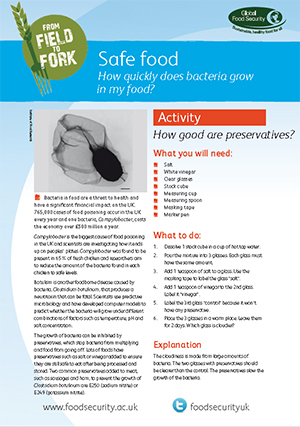 Different methods of preserving food can prevent bacterial growth and keep food safe to eat for longer. Carry out your own experiment with food preservatives to find out which ones work the best. This educational resource outlines food security activities you can try out at home. There are a number of different uses for food waste that could prevent reusable material from going to landfill. 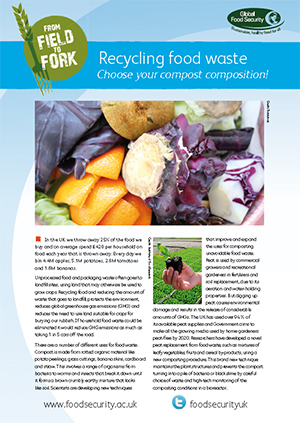 Explore which types of waste can be put to good use by designing the perfect compost composition. This educational resource outlines food security activities you can try out at home. Scientists are developing new crop varieties that have higher yields, helping farmers to produce more from the same area of land. Carry out an experiment to find out which is the best new wheat variety to grow with which fertiliser. This educational resource outlines food security activities you can try out at home. 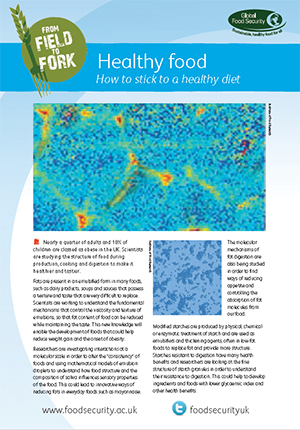 How can the structure of food make it healthier and tastier? Scientists are working to understand the mechanisms that control the viscosity and texture of emulsions, so that fat content of food can be reduced while maintaining the taste. 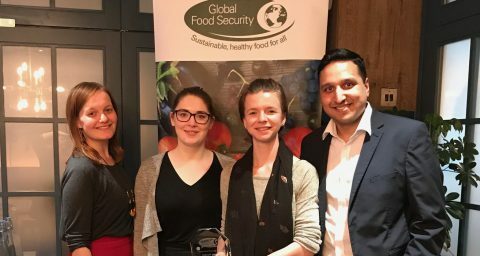 From Field to Fork: Getting hold of food? This educational resource outlines food security activities you can try out at home. Not all the food we eat is produced in the UK, with a great deal of it being imported from countries across the world. Find out how far your food has travelled using the internet. 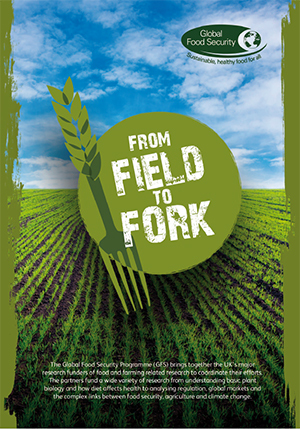 Download - From Field to Fork: Getting hold of food? This educational resource outlines food security activities you can try out at home. 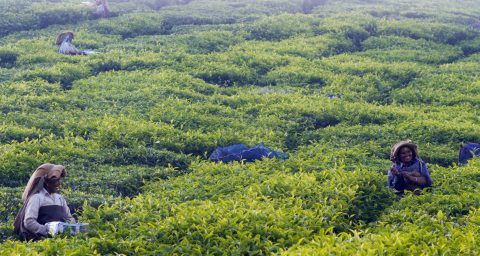 Crop disease can damage food production and leave people hungry. 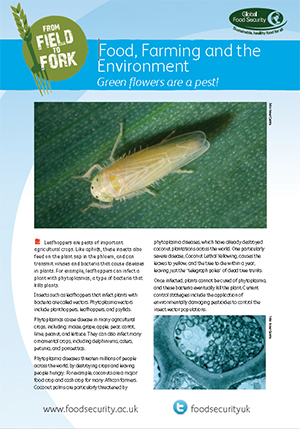 Explore your garden, a nearby park or school playing field to identify healthy and diseased plants.